After our visit with Matt Moore earlier in the week, we stopped by Nani Moon Mead today and met with owner Stephanie Krieger for a 5 flight mead tasting. 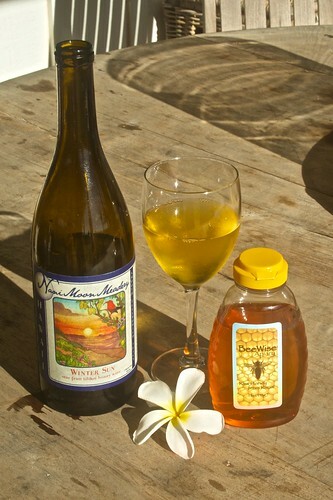 Stephanie produces small batches of mead using honey and fruit produced on Kauai and the other islands of Hawaii. 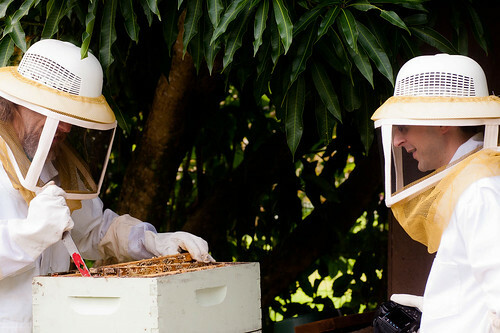 Matt Moore is one of her suppliers of honey which made the visit to Nani Moon a nice bookend to our beekeeping adventure on Kauai. After the tasting, we decided to go with the Winter Sun which is made with Kauai wildflower honey, starfruit, and passionfruit. Here is a picture of the mead with a bottle of Matt’s BeeWise Honey. Here is a video of Stephanie talking about her mead and all five varieties she produces. They do have wax moths and do have to worry about the common bee ailments like chalkbrood and nosema. 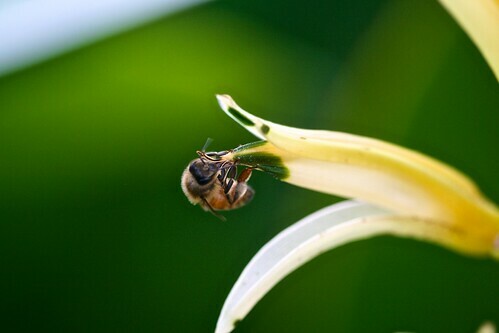 Starting a hive in Kauai is actually pretty hard because of all the restrictions on importing bees. 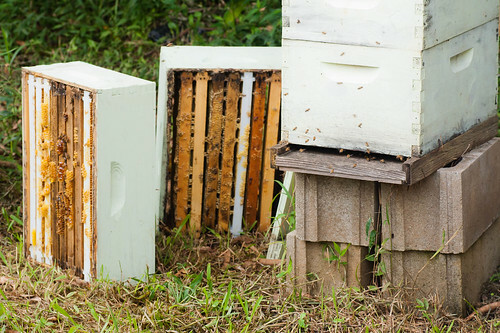 Most folks have to either catch a swarm or make friends with a local beekeeper to get a split. I really liked this sign as we walked towards the apiary. 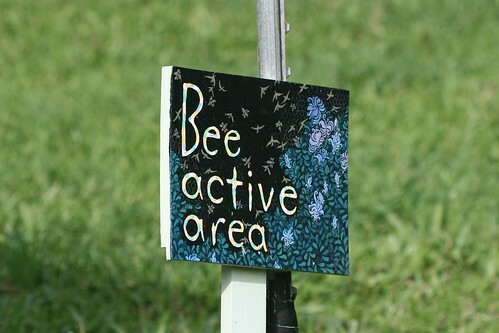 The farm is 10 acres with fruit trees all over the place so this is a nice reminder you are entering an area with lots of bees. Here is a shot of the apiary. 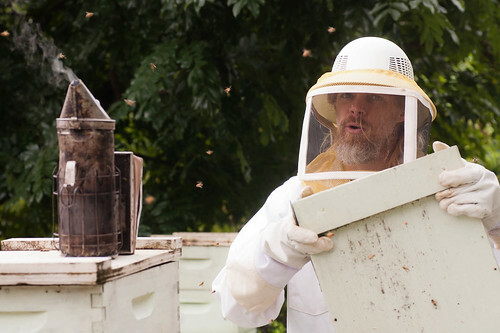 This is Matt Moore taking a cover off of one of the hives. Matt has an interesting way of removing supers (at least interesting to me). Instead of stacking supers as he removes them, he upends them as shown in the picture. He feels he squishes less bees this way. 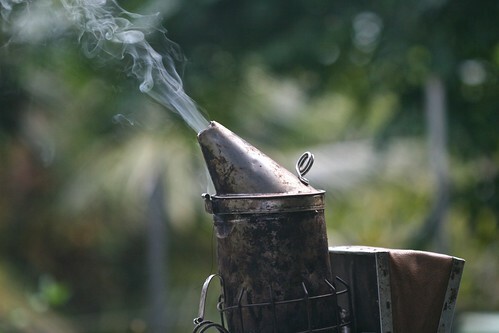 Matt’s lit smoker with coconut husk as fuel. It burns really well and produces a nice cool smoke. Matt and I opening up one of his hives. 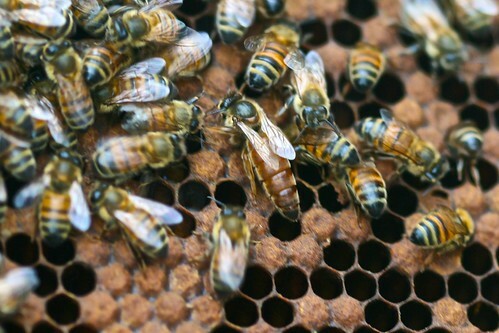 We spotted a queen on one of the first hives we opened up. Matt says the golden color is very typical of a Hawaiian Queen. 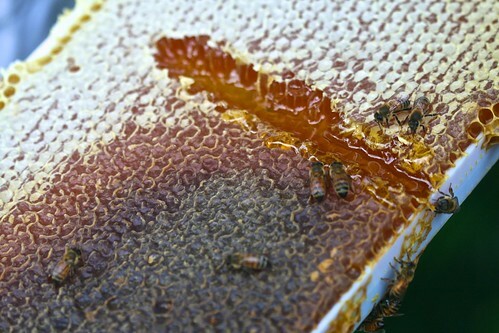 This was a nice frame of honey pulled from one of the hives. I was going to make this a two part post, but I still have a bunch of miscellaneous photos from our visit that I’ll post soon. 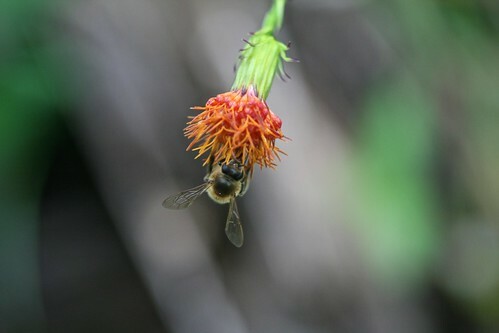 All in all, this was a great visit, and it is amazing how bees can adapt to all sorts of climates and geography. Aloha from the beautiful island of Kauai. Gitanjali and I will be spending the next week visiting our 50th State along with our friends Matt and Brenna. I was very curious about beekeeping practices in Hawaii so I arranged to meet up with Matt Moore who is a local beekeeper on the island. 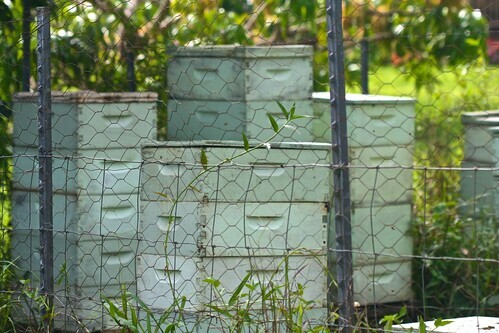 He keeps 30 or so hives on a beautiful 10 acre farm just northwest of Kapaa which is on the east side of Kauai. Before taking a peak at the hives, we explored the farm and got a sense of what the bees are currently using for pollen and nectar sources. This is Okinawa Spinach which is an edible ground cover. 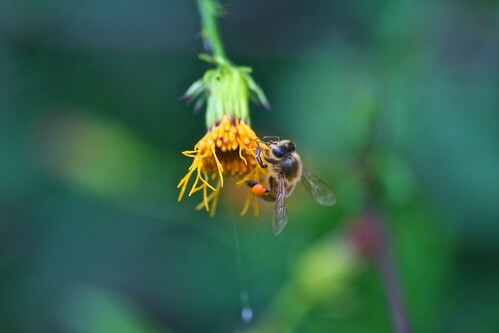 This is another shot of the spinach showing the pollen sac of a bee. 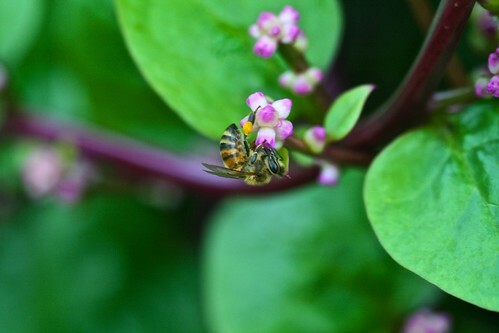 This is Malabar Spinach which is a perennial vine found in the tropics that also has edible leaves. This is Tulsi Basil which is a variety of basil found in India. Here we have the flower from a native Hawaiian yam. I didn’t catch the name of this plant but it was similar to a Bird of Paradise. 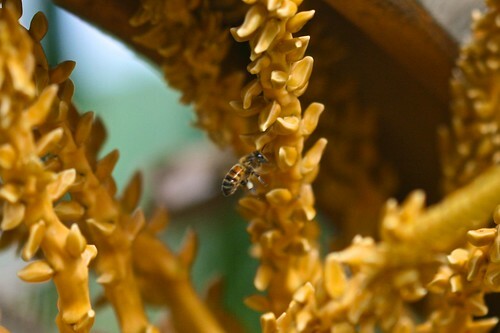 While not a good source of nectar, the pollen from coconut trees was very attractive to the bees. 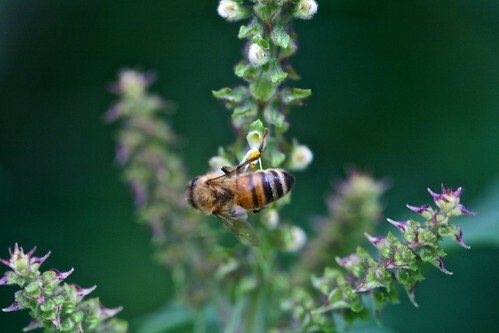 These were just a handful of the flora around the farm that the bees were visiting. 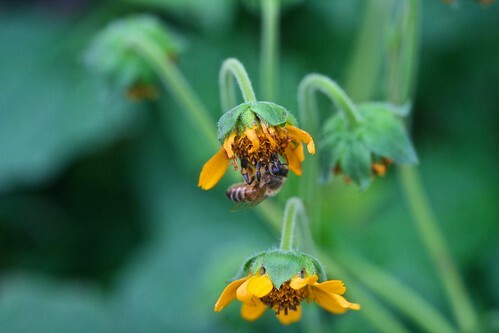 With so much in bloom, I figured the girls would produce honey all year, but this side of the island is very rainy and during the winter months, it rains a lot off and on through March. So even though the bees don’t slow down due to colder weather, they do go through a “winter” cycle as the rain keeps them in the hive more often than not during these months. Stay tuned for Part II. Mahalo.